Walt's People: Volume 20 features appearances by Sam Armstrong, Leland "Lee" Payne, Bob Givens, O.B. 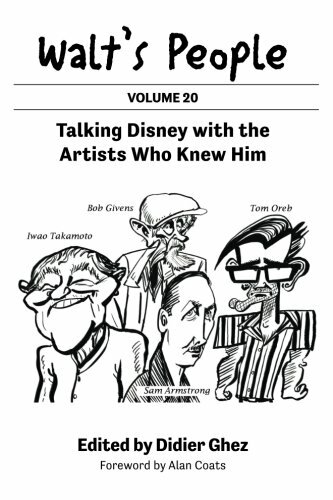 Johnston, Wilfred Jackson, Jack Hannah, Tom Oreb, Iwao Takamoto, Herb Ryman, and Alfred and Elma Milotte. O.B. JOHNSTON analyzes the Disney Studio's early merchandising efforts, and his own four decades with the company as the head of its character merchandising division, in this book-length memoir. WILFRED JACKSON recalls the triumphs and tribulations of his three decades as a director of numerous Disney cartoon and features, including Snow White, in two lengthy interviews with Michael Barrier and Milt Gray. HERB RYMAN talks about his early years at MGM, his experience as an art director for the Disney Studio, his transition into Imagineering, and his close friendship with Walt Disney. Animation historian Amid Amidi evaluates the career of TOM OREB, a little-known character designer and storyman who worked at the Disney Studio during the 1930s through the 1950s.